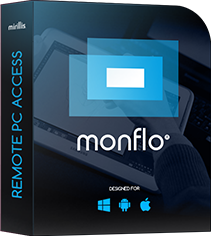 With Monflo Remote Access Software you can play all PC games remotely using another PC. Follow the tutorial below to learn how to play PC games remotely. When you run a fullscreen game on your Server PC, Monflo Client app automatically switches to Game Mode to allow to fully control games with using Client application. Now you can use your mouse and keyboard to play games just as you would sit in front of your remote PC. To switch to a fullscreen mode please use a button in the top right window corner or press RCTRL+F11 hotkey. In Game Mode your mouse is locked to video area of the PC you remote from and you cannot move mouse cursor freely outside of Monflo Client's window to control your host PC. To switch control back to your host PC please use RCTRL + M hotkey. To switch control back to your host PC please press RCTRL + F11 to exit fullscreen mode and then press RCTRL + M hotkey again to switch control to your host PC. Monflo Client application offers an option to Force game control mode to allow playing games running in windowed mode. To force Game Mode please use Force game control mode icon available on the top of Monflo Client app window or on the control panel in fullscreen mode. To disable Force game control mode option, please press RCTRL + M hotkey and press Game Mode icon again.